Here is the question I have asked on StackOverflow that somehow did not get the response I hoped for. I am trying it now here, as I am looking for a visually appealing solution. Ideally using a library would be great. On my site 33hotels.com I am using Buttons, such as provided by Twitter Bootstrap, to indicate hotels' amenities. What I need is to clearly display that an amenity is absent. For this, I am already displaying the button in red with text crossed by horizontal line. However, from user testing feedback, this is not enough to deliver the message that the amenity is absent. So I need something more clear. I am thinking of putting a Large cross (letter 'X' or an icon) on top of the button, that should be as large as the button and cover the button nicely, without sticking out. The cross should be thin as not to obscure the text but still clearly visible. How do you put an 'X' on top of a button? Any elegant and re-usable way to do it? Maybe define a web component (or Angular directive) "crossed" that can be attached to an HTML Element? Here is the ugly version of what I'm trying to achieve. However, apart from being ugly, it fails to make the text crossed readable. So perhaps I should use a thinner version of 'X'? EDIT. Inspired by the suggestion of Mr. E. Upvoter, changed colour to gray and added 'X', which on hover makes a more clear appearance. The button disappears upon click on itself (and not just on 'X'), to improve usability for people having difficulties to click on small icon. Many thanks for all suggestions! 'Greyed Out' - give the unavailable buttons some transparency, (or the appearance of transparency with lighter colours). This will make sure it is noticeably different from the other buttons, at the very least sparking curiosity as to why it's different. 'Strike-THROUGH!!!!' - "Like seriously guys look, I put a line through it." That usually means something negative. On tap or hover (you can simply use :hover for this, it works for tap consistently as well as far as I know - you just can't use it on a link without a workaround) offer the option to delete, and a proper explanation. See a JSFiddle Mockup of (div) buttons with hover help and delete buttons. A more elegant solution would be to grey out the button, set it's state to disabled and use a disabled cursor to clearly show the state. I've thrown together a quick codepen to demonstrate this. The fact that something isn't there at all is a great indication that it is not present! If you'd like to still display the things that were 'chosen but missing' in each result element I suggest not doing it as the same elements in the same section with the only difference being styling. Rather have it be clear to the user that this section shows what things a hotel has, and this section shows the things you searched for that were not included. Potentially having the 'chosen but missing' elements be a simple comma-delimited list of strike-through text that is presented in a way of being in the result but not appearing as if it is a description of the location. Thus a result is a visual element and a hotel is a visual element within the result and data describing each is separated as such. I think the logic is flawed. I choose some amenities and as a result I expect to see ONLY hotels that combine these amenities. 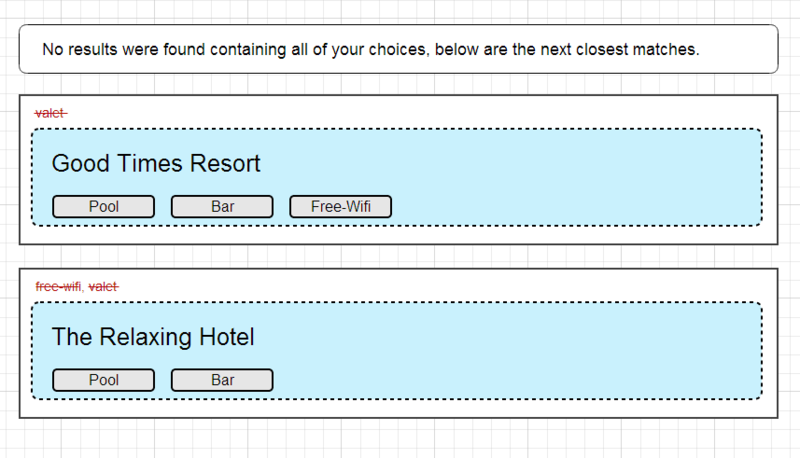 You should inform the user that there is NO hotels that have all the amenities and maybe let them see the results with missing amenities by clicking another button. The red crossed button works well in my opinion. If there are users that don't understand it, it's their problem. It works with the common web fonts: Arial, Verdana, Georgia etc. Not the answer you're looking for? Browse other questions tagged website-design css interface-design website-templates wayfinding or ask your own question. How to give a site a mockup look?